Aims and Objectives: Newer gingival displacement materials such as magic foam are available now and hence, there is a need to assess those materials with the commonly used gingival retraction cord. This study aimed to evaluate the gingival displacement width obtained using plain retraction cord and magic foam cord on an unprepared mandibular molar. Materials and Methods: Twelve patients in the age group of 20–30 years satisfying the inclusion criteria were selected. For each patient, pre- and post-displacement impressions were made using regular body addition silicone. The predisplacement impression served as the control. Gingival displacement procedures were performed in the buccal gingival sulcus of unprepared 1st mandibular molar. Both pre- and post-displacement impressions were sectioned and evaluated using a profile projector. The values were tabulated and analyzed using SPSS 16 software. Results: There was an increase of 62.4% in width of the gingival sulcus when displaced with cord and 61.6% increase using magic foam cord. The retraction cord provided 0.8% more gingival displacement when compared to the magic foam cord, which was not statistically significant. Conclusion: Weighing the pros and cons, it can be concluded that magic foam cord could be preferred over plain retraction cord as both methods provided almost the same amount of gingival retraction, and magic foam cord caused less trauma to the gingiva, was less time consuming, and easy to use. Marginal integrity is one of the important principles of tooth preparation. To achieve this, a satisfactory gingival displacement procedure is necessary. Judicious use of gingival displacement material is essential to obtain the determined benefits of retraction with no adverse effects to the tissues and make a detailed impression. To achieve displacement, the adjacent gingival tissue must be displaced with care to allow access to this region and provide adequate space for the impression material to be injected into the gingival area. Gingival displacement is defined as the deflection of the marginal gingiva away from the tooth. There are various gingival displacement techniques such as mechanical, chemico-mechanical, surgical, electrosurgery, rotary curettage, and injectable materials. Among these methods, impregnated and nonimpregnated retraction cords are most commonly used. These retraction methods being technique sensitive and causing trauma to the gingiva lead to the introduction of newer retraction techniques. Magic foam introduced recently for the purpose of mechanical method of gingival retraction is gaining importance. Magic foam cord (Colte'neWhaledent AG, Altstatten, Switzerland) is an expanding polyvinyl siloxane material which can be injected into the sulcus in gel form; the setting reaction releases hydrogen gas and becomes an expanded foam, thus results in deflecting the free gingival margin away from the tooth to achieve gingival displacement. The purpose of this study was to determine an appropriate gingival displacement system with no or minimal tissue trauma. In this study the gingival displacement was accessed on an unprepared tooth using magic foam cord and plain retraction cord (Ultrapak, Ultradent products.inc). A total of forty patients were screened with their consent and cooperation for the study of 6 months. The study was approved by Manipal College of Dental Sciences ethical committee and its amendment were considered for approval. (MCDC/528/2018). 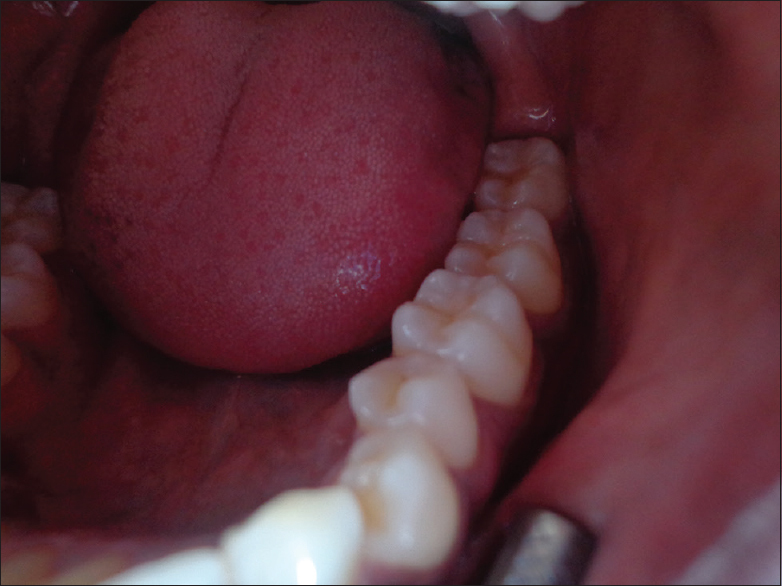 The patients underwent routine oral prophylaxis 15 days prior to screening. Gingival index, plaque index, bleeding on probing, probing depth, clinical attachment level, mobility, and sensitivity were assessed. The patients should be nonsmokers, male and female, free from caries and periodontal disease in the 1st mandibular molar, and within the age group of 20–30 years. Patients with gingival recession, high plaque index, bleeding on probing, pernicious oral habits, hormonal imbalance, on long-term medication, and with immunocompromised and debilitating preexisting systemic conditions were excluded. The number of samples needed before and after displacement was 12 as suggested by the statistician to obtain statistically significant results. Hence, 12 patients were chosen who best suited the criteria. Mandibular impressions were made using irreversible hydrocolloid material. Dental stone (Kalabhai Karson Pvt Ltd, 43/44 LBS Marg, Vikhroli (W), Mumbai 400 079, India) casts were poured for the fabrication of custom tray. The alginate (Algitex, DPI, India) and dental stone were mixed according to the manufacture's recommended water–powder ration. Once the cast was obtained from the impressions, 2–2.5 mm thickness modeling wax (Modeling wax no: 2, The Hindustan dental products, Pvt. Ltd, India) spacer was adapted 2 mm short of the vestibular sulcus on the casts and tissue stops were made on the noncentric cusps. An autopolymerizing polymethyl methacrylate custom tray of approximately 2 mm thickness was fabricated by dough method. Following the same method, another custom tray was fabricated on the same cast. 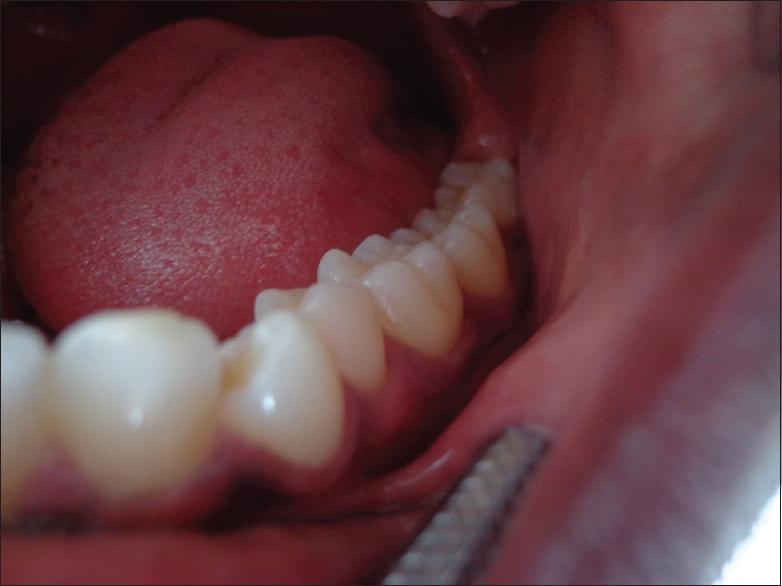 The wax spacer was removed, and the trays were checked in the patient's mouth for proper extensions and required corrections were made. Tray adhesive (38 West Clarke Avenue Milford DE 19963-1805) was applied. Latex-free gloves were used for the procedures., Regular body addition-type (Monophase, Type-II, Dentsply caulk Dentsply International Inc.) impression material was dispensed using auto-mix gun on to the custom tray and syringed around the teeth to be recorded. A preretraction mandibular impression [Figure 1] was made which was used as the control. Gingival retraction was carried out on the right and left 1st mandibular molars alternatively using retraction cord [Figure 2] and magic foam cord after 2 days of preretraction impression. The area to be recorded was isolated. The required length of retraction cord was dispensed and placed into the buccal gingival sulcus using a cord packer from mesial to distal direction. The retraction cord was left in place for approximately 5 min. Precautions were taken not to injure the gingiva. With the retraction cord in place, magic foam cord was placed on the contralateral gingival sulcus of the mandibular molar. Magic foam cord is a medicament-free, mechanical means of gingival retraction. Comprecap, provided by the manufacturer is used to hold magic foam cord in place during the retraction procedure. Appropriate size of Comprecap was selected and modified. Magic foam cord was injected into the contralateral buccal gingival sulcus of the 1st mandibular first molar [Figure 3]. 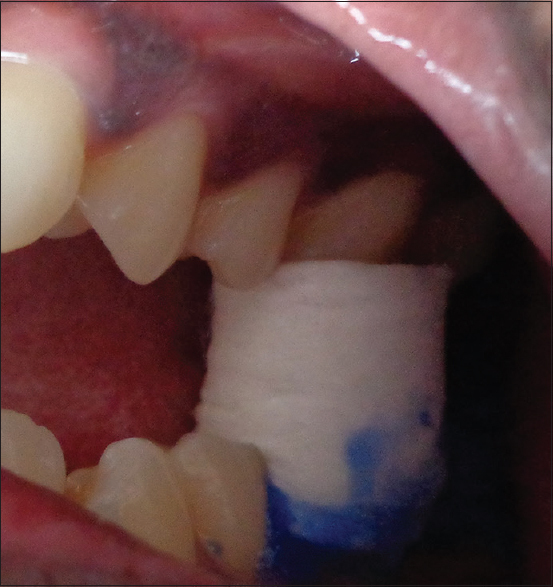 The selected Comprecap was placed on the tooth, and the patient was instructed to bite over it for 3–5 min [Figure 4]. Cotton rolls, retraction cord, and Comprecap were discarded prior to impression making. The gingival sulcus was verified for the leftover material. Tray adhesive was applied on the custom tray and allowed to dry. Regular body addition-type polyvinyl siloxane impression material was dispensed and mixed. The mixed material was loaded on to the custom tray and a postretraction mandibular impression was made [Figure 5]. All the impressions were disinfected before the next procedure. The pre- and post-retraction impressions were sectioned using a carborundum disc. Sectioning was done buccolingually at the buccal groove of the 1st mandibular molar along with the custom tray. This sectioning of impressions resulted in having two samples for each retraction procedure. A total of 48 samples were obtained after sectioning of the impressions. They were grouped for evaluation. The impression tag formed by retraction was measured [Figure 6]. The impression tags in the buccal surface of the samples were measured using a profile projector. Profile projector is also referred to as an optical comparator. The projector magnifies the required field and is projected on the built-in screen. The projection screen showed magnified image of the surface of the sample for computing linear dimensions. All the samples were measured with ×10 magnification. The width of the impression tag was measured with the use of an in-built Vernier caliper in the profile projector. The width of the impression tag indicated the amount of gingival retraction. The Vernier caliper delivered an accuracy of 1μ. To eliminate subjective errors, each sample was measured thrice and the consistent value was considered. For every group, pre- and post-retraction width in samples was measured. The difference between the post- and pre-retraction width of the individual groups was the amount of retraction achieved by the retraction procedure. This was calculated for all the samples. The values were tabulated and subjected to statistical analysis. All the values are in millimeter. All the procedures were followed in accordance with the ethical standards of experimentation by the Institutional Ethical Committee (Ref No: JSS/DC/Ethical/2011–2012). The duration of the study was 6 months. Descriptive statistics [Table 1] as well as advanced statistics were used. One-way ANOVA [Table 2], paired samples t-test [Table 3], [Table 4], [Table 5], [Table 6] group statistics [Table 7] as calculated where to arrive at standard deviation and standard mean error for each method of gingival displacement., and independent-samples t-test [Table 8] were used to analyze the data using SPSS for Windows, Version 16.0. (SPSS Inc., Chicago, IL, USA). In this in vivo study, gingival displacement using plain retraction cord showed 62.4% of increase in the amount of gingival displacement. An average of 0.767 mm [Table 4] horizontal gingival displacement was obtained with plain retraction cord. Magic foam cord showed 61.6% of increase in the amount of gingival displacement when compared with that of predisplacement impressions. An average of 0.757 mm [Table 6] horizontal gingival displacement was achieved with magic foam cord. The retraction cord provided 0.8% more displacement [Graph 1] when compared to magic foam cord but was not statistically significant (P < 0.001). In the era of computer-aided design (CAD)-computer-aided manufacturing restorations, the accuracy and fit of the final prosthesis has been enriched. However, the success and longevity of these restorations is majorly dependent on impression making and gingival retraction. To avoid marginal leakage, fit of the prosthesis at the finish lines is critical. Previously, knife-edge finish lines were preferred for the success of gold restorations as they are malleable. Due to the economic factors and esthetics, the use of base metal alloys and dental ceramics came into routine use. Hence, detailed reproduction of finish lines onto the dies and casts is necessary. It is one of the major reasons for the success of these restorations. A common objective for impressions for an interim/fixed dental prosthesis is to register the prepared abutments and finish lines precisely. Three criteria for gingival displacement materials are gingival displacement and hemostasis, reversible damage to the gingiva, and paucity of untoward systemic effects. A study using copper bands with rubber base impression material concluded that the accurate reproduction of the prepared tooth margin was possible. However, in a similar study, impression was first made with wax under finger pressure with copper band and then rubber base impression along with the use of copper band. The author concluded that this method provided the maximum gingival retraction. Coelho and Brisman in their study with the use of copper band found an average recession of 0.33 mm after 6 months. The use of copper bands also caused incisional injuries of gingival tissues and recession. Retraction cord is a widely used method for mechanical retraction, both in plain and impregnated forms. Caustic chemicals such as sulfuric acid, trichloroacetic acid, negatol, and zinc chloride have been tried by Woycheshin. The tissues when observed immediately after retraction showed tissue injury. All the chemicals caused gingival recession when observed after 7–14 days of healing. The undesirable effects on the gingiva led to their abandonment. Racemic epinephrine had emerged as the most popular chemical for gingival retraction. The literatures in the 1980s documented that cord impregnated with 8% racemic epinephrine was the most commonly used means of producing gingival retraction. An animal study using epinephrine which led to hemostasis and caused localised vasoconstriction in the gingival sulcus in the dogs also ended in gingival shrinkage. A human study with epinephrine cord did not produce significantly greater gingival inflammation than potassium aluminum sulfate or aluminum chloride. 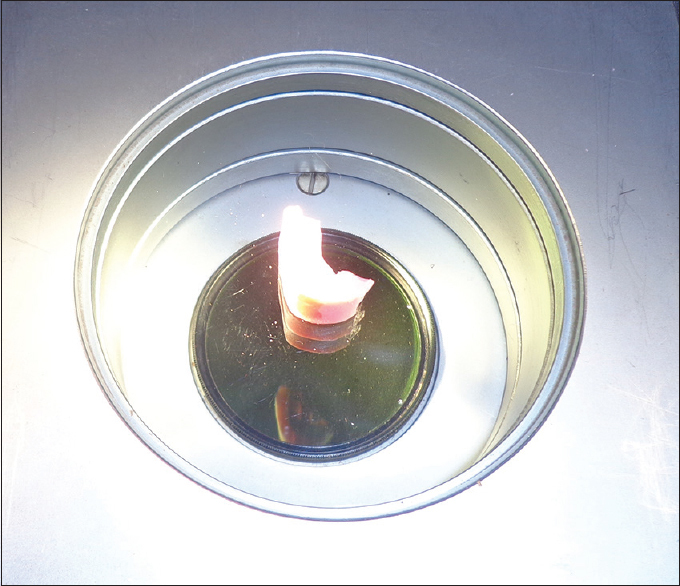 A study comparing cords impregnated with aluminum chloride, alum, and epinephrine concluded that there were no significant changes in sulcular width among the three, but the use of concentrated aluminum chloride cords caused gingival inflammation and hence epinephrine-impregnated cord had to be used with careful medical evaluation of the patients. Stark et al., in their study comparing plain retraction cord, epinephrine-impregnated cord, and electrosurgery, came to a conclusion that plain cord did not cause recession and no variation in blood pressure with adequate gingival retraction achieved. Hence, plain gingival retraction cord was preferred for the study. Retraction cords are available in various sizes, with 000 size retraction cord being the thinnest. The thinner the retraction cord, the lesser is the trauma to the gingival margin. Jokstad stated that knitted cords ranked better than twined cords. When retraction cord is placed in the gingival sulcus with isolation, the cord absorbs the crevicular fluid and swells up providing adequate amount of retraction. To minimize the trauma to the gingiva during retraction procedures, paste forms of retraction materials were introduced; for example, Expasyl. The amount of gingival retraction obtained with impregnated or stay-put retraction cord was not achieved with Expasyl. Magic foam, one among the paste forms of gingival retraction material introduced in the past decade, has shown to be a successful means of medicament-free mechanical method of gingival retraction. Hence, it was chosen to compare the gingival retraction with plain gingival retraction cord. Regular body addition-type (polyvinyl siloxane) elastomeric material has been proven to be advantageous with single-mix technique. Addition-type elastomeric material was introduced as a dental impression material in the 1970s and has less dimensional changes with time as compared to that of condensation silicon material. The impressions made by this material can be preserved for 14 days with negligible dimensional changes of 0.03% (ISO). Baharav et al. conducted a study to evaluate the ideal time required to achieve gingival retraction. The cord was left in the sulcus for 2, 4, 6, and 8 min. The authors observed that there was no difference in the gingival retraction done for 4, 6, and 8 min. They concluded that cord should remain in the gingival crevice for an optimum time of 4 min prior to impression making. Laufer et al. checked the time required for closure of the gingival crevice following gingival retraction. Chemomechanical retraction method was advocated for the displacement of the gingival crevice. The closure rate at the transitional line angle area was significantly faster than that of the mid-buccal area during the first 90 s. Hence, the impression was to be made immediately after retraction procedure. The impression tags in the buccal surface of the samples were measured using a profile projector. Subjective errors are lesser in profile projector when compared to those in measurements obtained using a microscope. The magnified images from the microscope were to be transferred to the computer to measure the amount of gingival retraction. It was found that there was an increase of 62.4% in the width of the gingival sulcus when retracted with cord and 61.6% increase using magic foam cord. 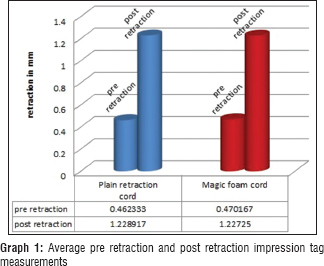 The retraction cord provided 0.8% more retraction when compared to magic foam cord, which was not statistically significant. A study by Gupta et al. also indicated similar results. There was no significant difference in the amount of gingival retraction by stay-put and magic foam cord. The results obtained after gingival retraction using stay-put, Expasyl, and magic foam cord were 0.233, 0.151, and 0.199 mm, respectively. In a recent study carried out on thirty individuals using Ultrapak cord, Merocel strip, and magic foam cord, the gingival displacement was done immediately, 7 and 14 days after the tooth preparation. The displacement achieved was measured using images obtained from image analyzer captured using stereomicroscope. The authors came to a conclusion that Merocel strip provided the maximum amount of displacement and was statistically significant. There was minimal hemorrhage using magic foam cord during gingival displacement. A study comparing gingival displacement using retraction cord and diode laser was performed on 74 prepared abutment teeth; the comparative impressions were made after 15 days. The comfort of the patients was evaluated using the Visual Analog Scale. The study concluded that displacement with diode laser was more comfortable when compared to that of retraction cord. The displacement was not significant. Gingival displacement is fairly practiced. In this study, the displacement was done in unprepared tooth. Most of the clinicians practicing esthetic dentistry do understand the importance of minimal damage to the gingiva. Hence, gingival displacement has to be done prior to tooth preparation to achieve utmost results and prevent damage to the gingiva during preparation as well. The 1st mandibular molar was chosen as it has the largest surface area when compared to any other teeth in the oral cavity. The 1st mandibular molar is easily accessible than the 2nd or 3rd mandibular molar or any maxillary molar for that matter. The contralateral molar of a patient will be approximately of the same size, and the gingival attachments of both left and right molars are approximately at the same level for an individual. The impression tags of left and right side preretraction impression had minimal variation. Gingival retraction procedures in this study were done on the buccal gingival sulcus of the 1st mandibular molar. The comparison of gingival retraction achieved will not be apt when compared with anterior and posterior teeth. Every study when critically evaluated will have its pros and cons. This study was done on unprepared mandibular 1st molar. The results may vary with the prepared teeth as well as with premolars and anterior teeth. This study is unique as all the studies related to gingival displacement were conducted on prepared teeth. Only mechanical means of tissue displacement method was employed and compared. The impressions made in this study were with regular body. The impressions could have been relined with light body material as well. Use of CAD-processed imaging could provide the similar or more details. Continuous advancements and various studies were done to compare the materials to choose an appropriate material. An assessment can be done related to tissue trauma around the unprepared teeth. A follow-up of patients could provide the tissue health postgingival displacement. The use of intraoral scanners could provide significant data to know the tissue health. Within the timeframe of the current assessment, satisfactory results were obtained to arrive at a conclusion on the choice of the material. Both the postretraction impressions showed increase in gingival sulcular width as compared to that of preretraction impressions. The retraction cord provided more retraction when compared to magic foam cord but was not statistically significant (P < 0.001). Magic foam cord could be preferred over plain retraction cord, and magic foam cord causes less trauma to the gingiva and is less time consuming and easy to use. 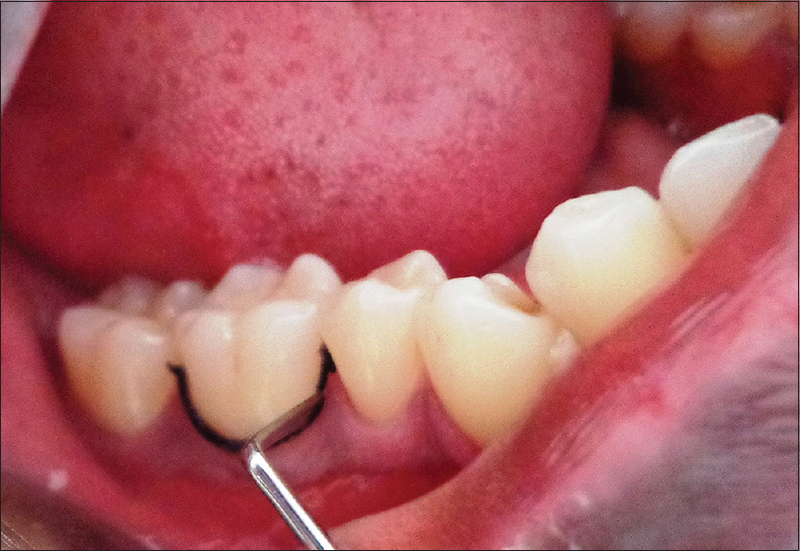 It is up to the clinician to decide the appropriate material and technique for gingival displacement to achieve desired results with preservation and no/minimal tissue damage. The authors thank Dr. Lancy D'souza, for rendering his valuable help in carrying out the necessary statistical analysis and all the subjects who obliged to be a part of this study. The glossary of prosthodontic terms. J Prosthet Dent 2005;94:10-92. Bennani V, Schwass D, Chandler N. Gingival retraction techniques for implants versus teeth: Current status. J Am Dent Assoc 2008;139:1354-63. Rosenstiel SF, Land MF, Fujimoto J. Contemporary Fixed Prosthodontics. 2nd ed. Tokyo, Japan: C.V Mosby. Co, 1995.
de Camargo LM, Chee WW, Donovan TE. Inhibition of polymerization of polyvinyl siloxanes by medicaments used on gingival retraction cords. J Prosthet Dent 1993;70:114-7. Sturdevant CM, Barton RE, Sockwell CL, Strickland WD. The Art and Science of Operative Dentistry. 2nd ed. St. Louis: C.V Mosby. Co, 1985. Shillingburg HT, Hobo S, Whitsett LD, Jacobi R, Brackett SE. Fundamentals of Fixed Prosthodontics. 3rd ed. Chicago: Quintessence Publishing Co, Inc., 1997. Safari S, Ma VS, Mi VS, Ghavam FH, Hamedi M. Gingival Retraction Methods for Fabrication of Fixed Partial Denture: Literature Review. J Dent Biomater 2016;3:205-13. Malone WF, Koth DL. Tylman's Theory and Practice of Fixed Prosthodontics. 8th ed. St. Louis, Mo: Ishiyaku EuroAmerica, Inc., 1989. Stern N. A band and rubber-base impression technique for fixed restorations. J Prosthet Dent 1971;26:491-6. Darby H, Darby LH 3rd. Copper-band gingival retraction to produce void-free crown and bridge impressions. J Prosthet Dent 1973;29:513-6. Coelho DH, Brisman AS. Gingival recession with modeling-plastic copper-band impressions. J Prosthet Dent 1974;31:647-50. Woycheshin FF. An evaluation of the drugs used for gingival retraction. J Prosthet Dent 1964;14:769-76. Houston JB, Appleby RC, DeCounter L, Callaghan N, Funk DC. Effect of r-epinephrine-impregnated retraction cord on the cardiovascular system. J Prosthet Dent 1970;24:373-6. Harrison JD. Effect of retraction materials on the gingival sulsus epithelium. J Prosthet Dent 1961;11:514-21. Donovan TE, Gandara BK, Nemetz H. Review and survey of medicaments used with gingival retraction cords. J Prosthet Dent 1985;53:525-31. Stark MM, Nicholson DJ, Soelberg KB, Kempler D, Pelzner RB. The effects of retraction cords and electrosurgery upon blood pressure and tissue regeneration in rhesus monkeys. J Dent Res 1977;56:881-8. Jokstad A. 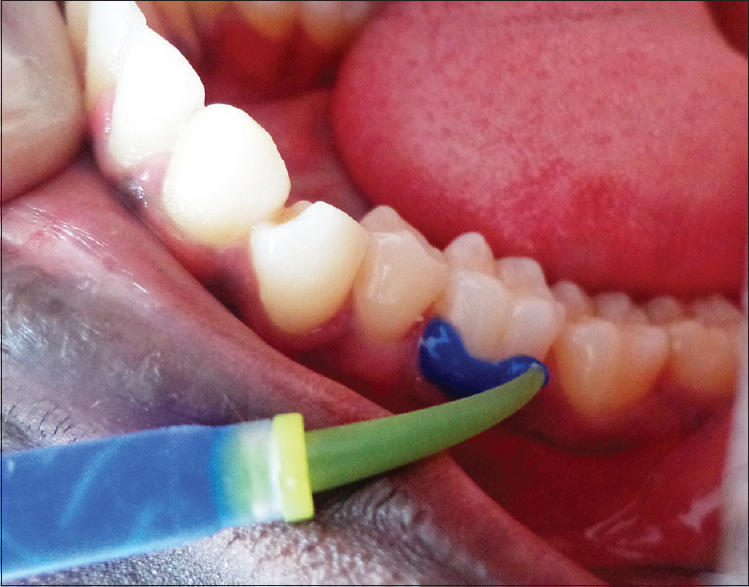 Clinical trial of gingival retraction cords. J Prosthet Dent 1999;81:258-61. Gupta A, Prithviraj DR, Gupta D, Shruti DP. Clinical evaluation of three new gingival retraction systems: A research report. J Indian Prosthodont Soc 2013;13:36-42. Chaudhari J, Prajapati P, Patel J, Sethuraman R, Naveen YG. Comparative evaluation of the amount of gingival displacement produced by three different gingival retraction systems: An in vivo study. Contemp Clin Dent 2015;6:189-95. Baharav H, Laufer BZ, Langer Y, Cardash HS. The effect of displacement time on gingival crevice width. Int J Prosthodont 1997;10:248-53. Laufer BZ, Baharav H, Langer Y, Cardash HS. The closure of the gingival crevice following gingival retraction for impression making. J Oral Rehabil 1997;24:629-35. Thimmappa M, Bhatia M, Somani P, Kumar DR. Comparative evaluation of three noninvasive gingival displacement systems: An in vivo study. J Indian Prosthodont Soc 2018;18:122-30. Melilli D, Mauceri R, Albanese A, Matranga D, Pizzo G. Gingival displacement using diode laser or retraction cords: A comparative clinical study. Am J Dent 2018;31:131-4.